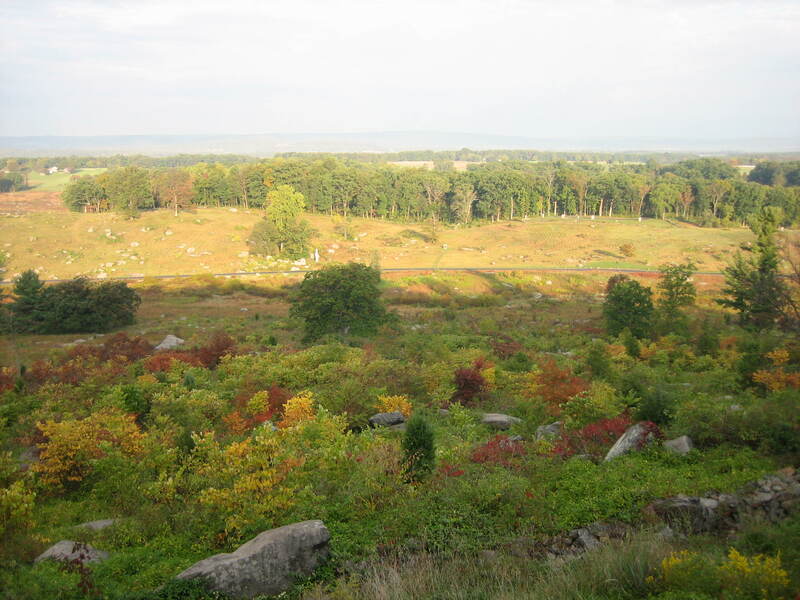 It’s early fall, and the leaves began to change color this week at Gettysburg. 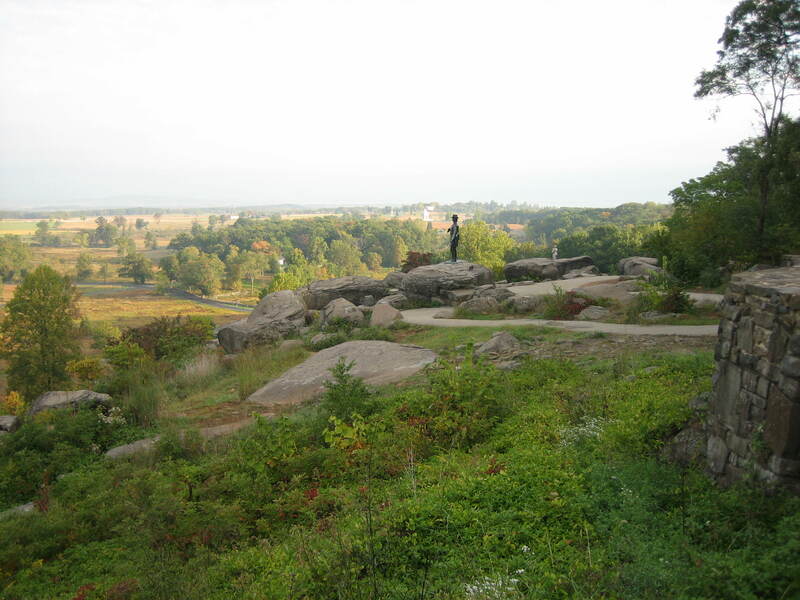 This is a view of Plum Run Valley (Valley of Death) from west of the 91st Pennsylvania Infantry Monument on Little Round Top. The South Mountain (Appalachian Mountain) range is just visible in the distant background. This view was taken from the east facing west at approximately 8:00 AM on Saturday, October 4, 2008. The leaves are just beginning to change color, and we hope the colors are striking. 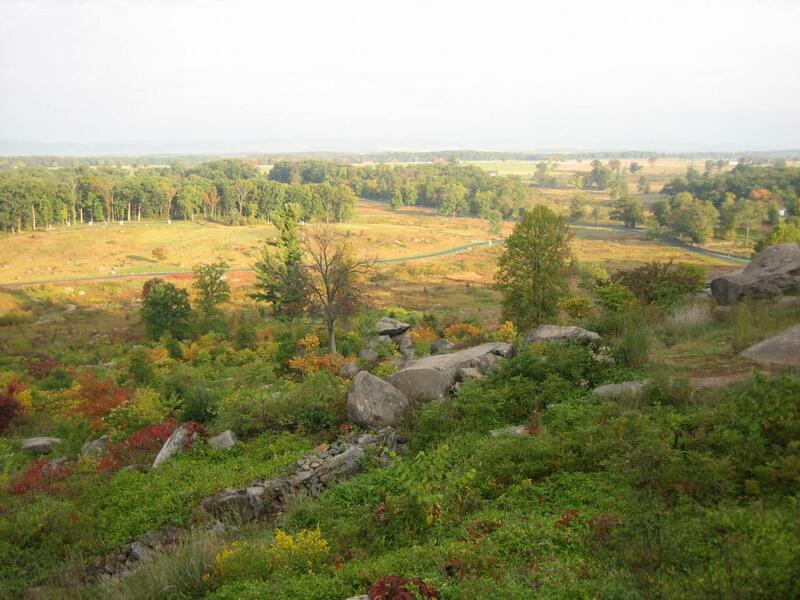 For those who cannot visit Gettysburg this month, we have decided to show photographs of this change of seasons. 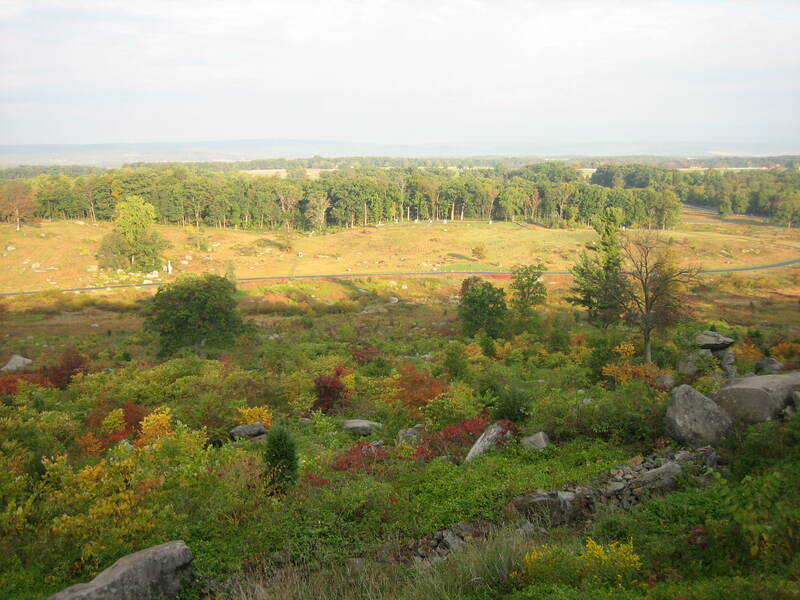 So approximately once a week, depending on the weather, we will take photographs of this part of the battlefield from in front of the 91st Pennsylvania monument. We’ve stitched together today’s photographs into a panorama. For a medium-sized version of the panorama click here. For the larger JPEG version, click here. If you’d like to see the uncompressed TIFF file, you can download it here (18.2 MB). We will “pan” this area from left to right, or south to north. This picture shows the castle-like monument to the 44th New York Infantry Regiment. In front of (north of) and to the right of the 44th New York is the monument to the 140th New York Infantry Regiment. The monument to the 16th Michigan Infantry is down the slope to the right (west). Big Round Top is in the background. In the foreground is the stone wall constructed by United States soldiers during the battle. This view is from the north facing south at approximately 8:00 AM on Saturday, October 4, 2008. The monument to the 16th Michigan is to the left of this view. In the background is the foot of Big Round Top. In the right background, a blue-green Gettysburg Foundation vehicle is pulled up to clean the restrooms in the Slaughter Pen. The white barn at the Bushman Farm is in the upper right section of this photo. This view is from the northeast facing southwest at approximately 8:00 AM on Saturday, October 4, 2008. The stone building with the restrooms in the Slaughter Pen is on the left. 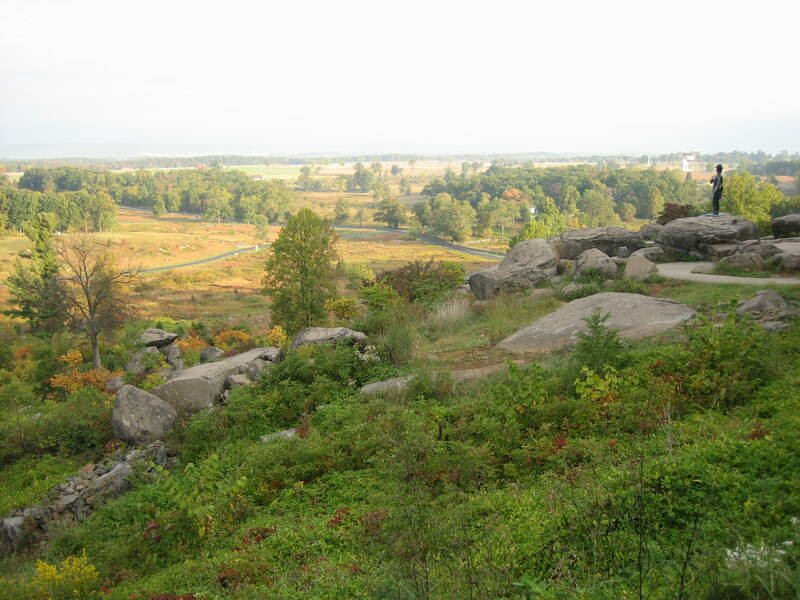 The rocks at Devils Den are to the right of the restrooms and the parking area at Sickles Avenue. The white barn on the Bushman farm is below the treeline on Warfield Ridge. 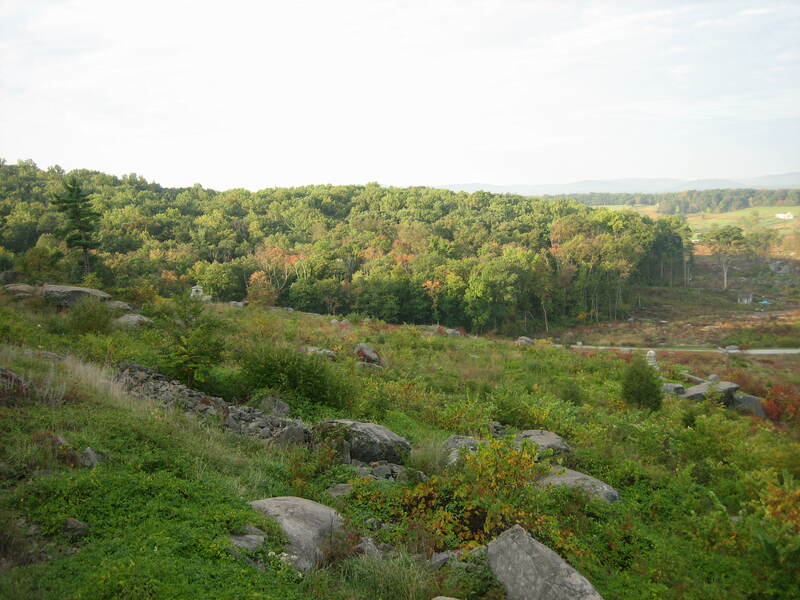 Houck’s Ridge, of which Devils Den occupies the southern end, is clearly visible in the sunlight. 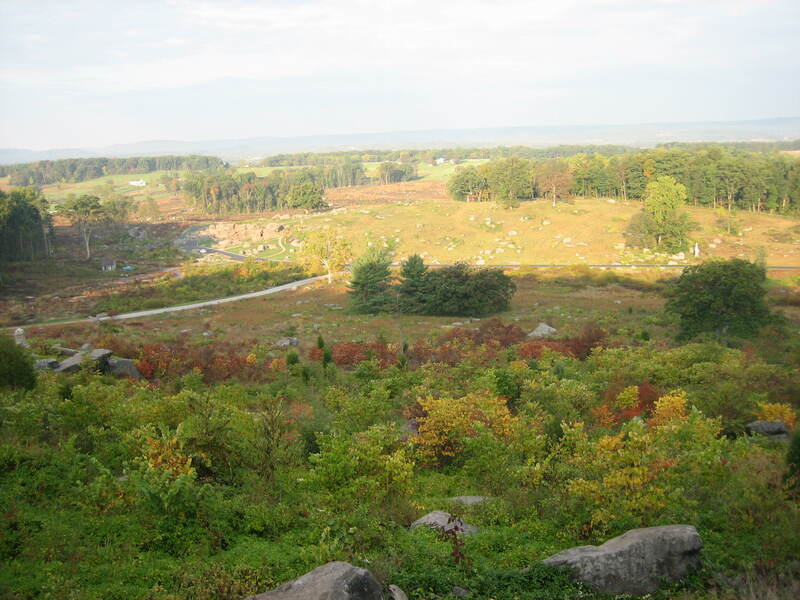 The light colored shaft for the monument to the 6th New Jersey is in Plum Run Valley (Valley of Death), and is located towards the right of this photograph. It is west of Crawford Avenue above a dark green tree in the Valley of Death, and to the right of a larger, lighter colored tree at the foot of Houck’s Ridge. View is from the northeast facing southwest at approximately 8:00 AM on Saturday, October 4, 2008. The monument to the 6th New Jersey is towards the left of this photograph. The monument to the U.S. Regulars on Ayres Avenue are now shown towards the right of this photograph. The lighter colored monuments to the Regulars are located east of the line of trees on Houck’s Ridge. Part of Rose’s Wheatfield is now visible to the right of this photograph. View from the southeast facing northwest at approximately 8:00 AM on Saturday, October 4, 2008. The U.S. Regulars monuments on Ayres Avenue are to the left of this photograph. The corner of Rose’s Wheatfield is in the center of the photo. The Pickett’s Charge (Longstreet’s Assault) fields are in the center and right background. View from the southeast facing northwest at approximately 8:00 AM on Saturday, October 4, 2008. The corner of Rose’s Wheatfield is on the left of this photo. The fields of Pickett’s Charge (Longstreet’s Assault) are in the center background. 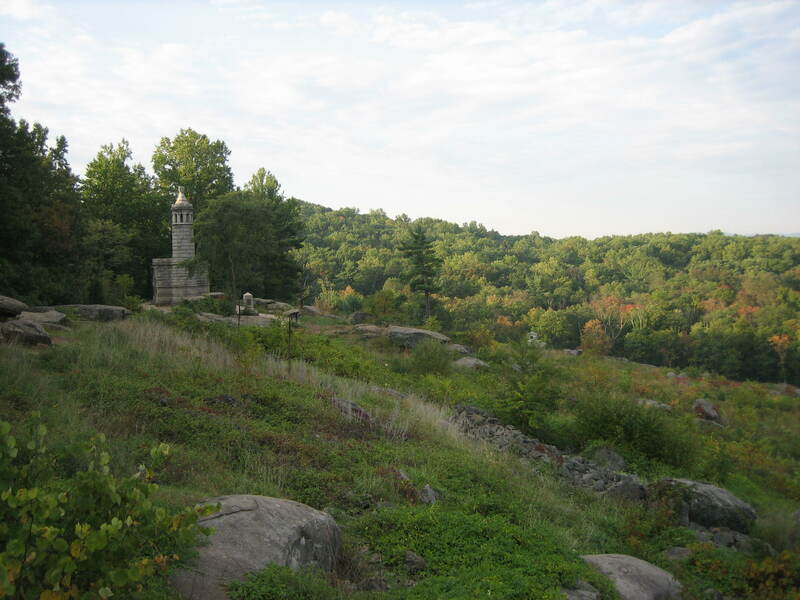 The statue to Gouverneur K. Warren, standing on his rock, is on the right. View from the southeast facing northwest at approximately 8:00 AM on Saturday, October 4, 2008. The Pickett’s Charge (Longstreet’s Assault) fields are in the left background. The statue of Gouverneur K. Warren, standing on his rock is in the center. Above Warren’s head are the trees on Cemetery Hill. Above and to the left of Warren is the light colored, Pennsylvania State Monument. Above the Pennsylvania monument, in the trees on Cemetery Hill, still sits the Cyclorama Building. The top of the monument to the 155th Pennsylvania Regiment is visible above the rocks to the right of the Warren Statue. View is from the south facing north at approximately 8:00 AM on Saturday, October 4, 2008. See our post on the Warren Statue turning green on September 5, 2008. See our post on the monument to the 155th Pennsylvania Regiment on April 17, 2008. Back on Reynolds Avenue, this is the fifth day that asphalt is touching the right flank marker of the 147th New York. The lighter colored left flank marker to the 56th Pennsylvania is in the foreground, and the darker colored 147th Marker is above it and to the left (you know, the one with asphalt touching it). The McPherson Barn is in the background. The long shadow going across Reynolds Avenue is from the statue to United States Brigadier-General James Samuel Wadsworth. 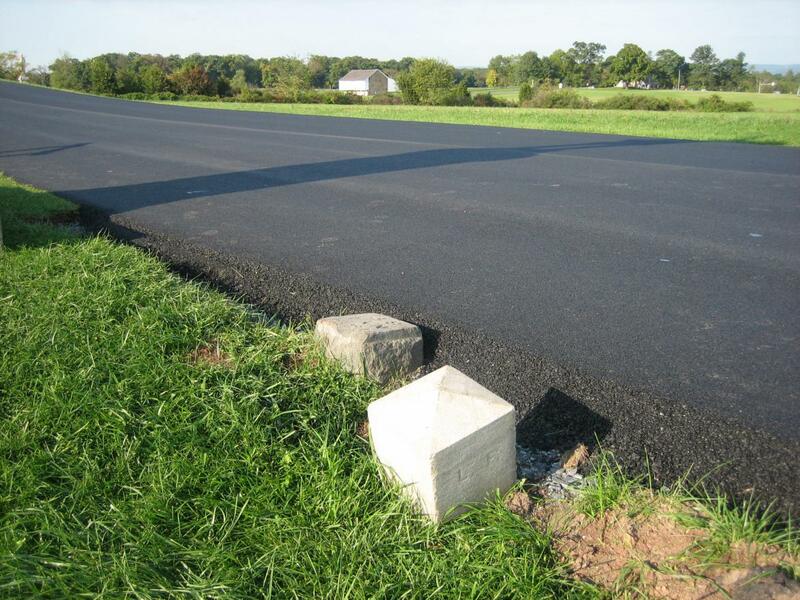 Some National Park Service officials at Gettysburg tell us that they are aware of this asphalt problem. We hope that their awareness soon turns into positive action. View from the northeast facing southwest at approximately 9:00 AM on Saturday, October 4, 2008. See our orignal post on asphalt touching this marker on September 30, 2008.